In this example, we will show you how to add custom fields to a customer record. EX: a training company wants to store a contract number. 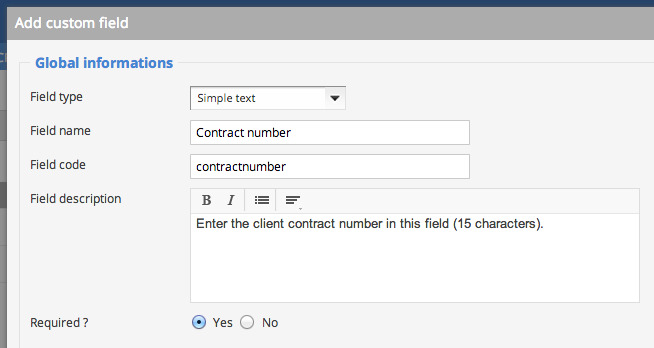 As our contract reference numbers include letters, choose the 'simple text' field type. The field code will be useful for imports or API. Enter a single value (without accents and no spaces) or code. The description will display help for users, as in the screenshot below. You can also make it a mandatory field if you want to require your team to qualify leads. Just below, you can define the perimeter for your new field among Sellsy's objects. In our example, only customers are concerned as shown in capture. The third part of the settings allows you to set preferences. These vary depending on the type of field. 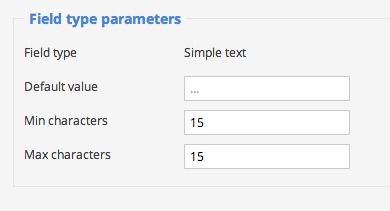 In our example, we know that the contract reference number is always 15 characters. We can set limits that will avoid any typing errors . Click Save and the field appears in the list of custom fields. The field is now active: every time a new client is created, this field must be necessarily filled . If you enter too short a value, you will get an error when saving. Once our client is successfully created, we can find the custom field on his/her record. In the following FAQ articles, learn how to use this information to search among your customers and display custom fields in the columns of your lists.